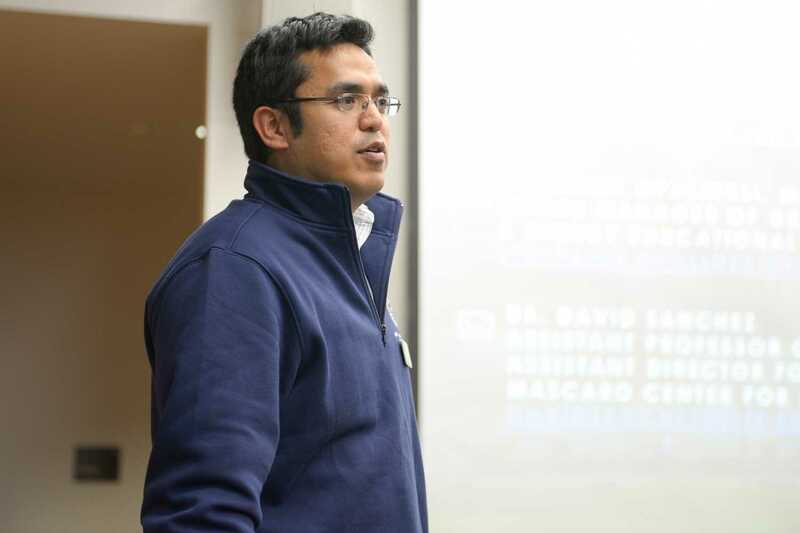 David Sanchez has seen Pittsburgh at the forefront of producing environmentally sound projects ever since his first fellowship at Pitt in the mid-2000s. Now, as an assistant professor in Pitt’s civil and environmental engineering department, he’s helping set up the Swanson School of Engineering’s new master’s program in sustainable engineering. The new 30-credit degree, designed over the summer of 2016 and completed in early 2017, will base its selection criteria on the applicant’s academic record, prior degree accreditation, interest and test scores. It requires students to take five core courses, including Current Issues in Sustainability, meant to provide a common foundation for sustainability and unite all incoming graduate students with various backgrounds. The Swanson School and the Swanson School’s Graduate and Online programs hosted an information session for the new master’s degree program Thursday night in Benedum Hall. It gave the attendees the opportunity to learn more about Pitt, gain a better understanding of how the program works and discuss the application. Pitt joins schools like Villanova and the Rochester Institute of Technology in offering a sustainable engineering masters degree. Students enrolled in the program will be required to take five elective courses, such as Wastewater Collection and Treatment Plant Design, which instructs students on the process design and economic evaluation of wastewater collection and treatment systems. Sanchez said the department has recruited and met with students interested in the new degree from universities across the nation, including Tulane University, Texas Christian University, Virginia Tech and Tufts University. Pitt held online information sessions for students who couldn’t make it to Pitt’s campus. Applications are now being accepted on rolling admission. The program is hosted through Pitt’s Mascaro Center for Sustainable Innovation, and the degree is awarded through the Swanson School of Engineering. Sanchez credited the inspiration for the program to Jack Mascaro, the founder of the center. While Sanchez credited Mascaro as the primary organizer of the program, Stephanie Opalinski, the senior manager of graduate engineering recruitment and energy educational programs, said it was Pittsburgh’s reputation in the STEM field that contributed to the creation of the new program. She cited how Pittsburgh was accredited as one of the top 10 cities for STEM-related job prospects, and CNN released an article naming Pittsburgh as one of the top cities “living in the future”. Opalinski also said the program was looking forward to being “hands-on” with its students, so a low number of people enrolled in the program is ideal. “We have a chance to engage with the students and make sure that they really understand this new program,” she said. Opalinski also said the organizers of the program told applicants that their background shouldn’t stop them from applying. She said the program is open to non-engineering STEM majors, as well as students from other backgrounds, such as business. Sanchez, along with Opalinski, said the program would accept applications from anyone that met the requirements, such as maintaining a B-average during undergraduate studies and completing the Graduate Record Examination. He also emphasized that he considers letters of recommendation more important than GRE scores, because he wants to know the character and experience of the students he is admitting. “As long as they’re not afraid to go in and take whatever they need to catch up, such as prerequisites, they’d be welcome,” he said. The presentation included details about potential hands-on experience students could gain in doing research on applying sustainable engineering practices at a local level. Sanchez said the program is flexible enough to allow students the chance to complete an independent study if they want to. Julia Mounat, a junior microbiology major, said she did not know much about the program at the beginning of the information session but had an interest in engineering despite not studying it for her undergrad. As a major in the STEM field, she had noticed that sustainability was becoming increasingly relevant across all fields. “I want to understand what it [the degree] does and what people with this degree can do with it,” she said. Sanchez said the program will be housed under multiple departments in the engineering school, so there is some flexibility in the curriculum depending on a student’s interests.